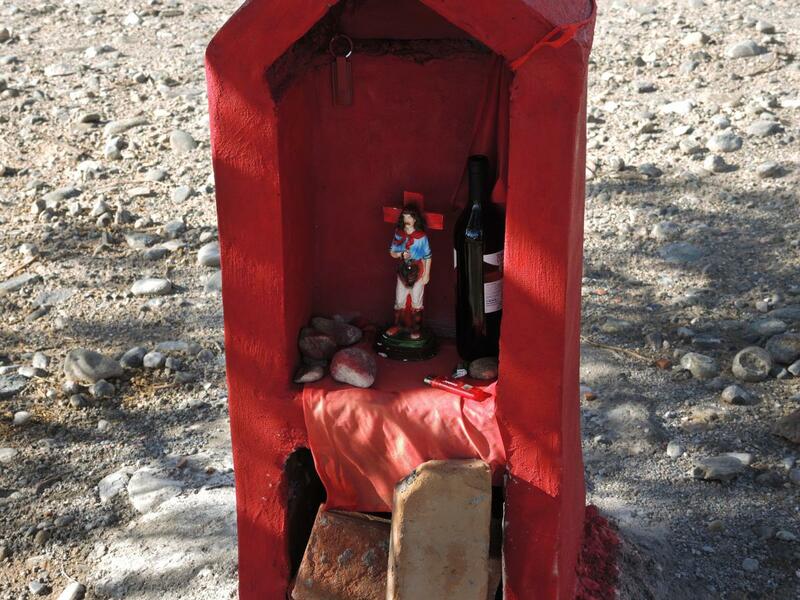 A driver in north central Argentina regularly comes across shrines to Gauchito Gil (sometimes known as Gaucho Gil) along the roadside. 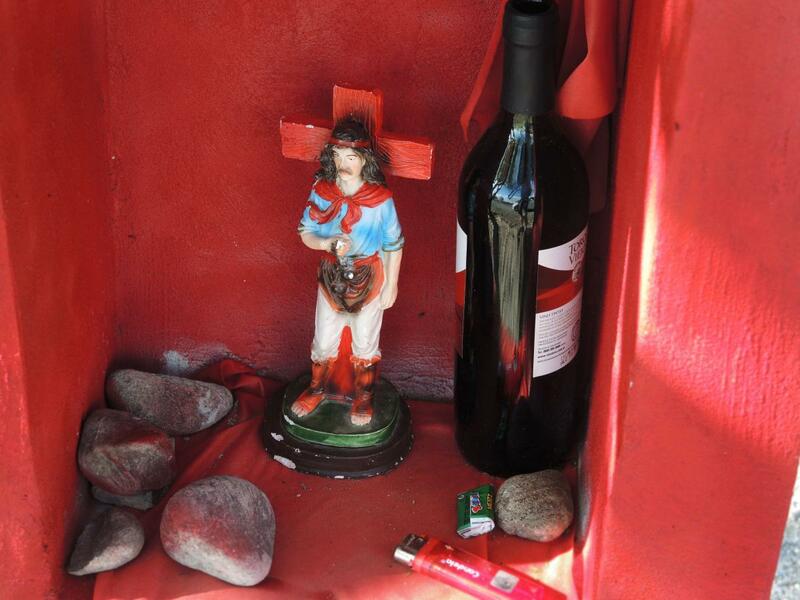 Marked with bright red flags and red paint, Gauchito Gil’s roadside shrines resemble the small Christian shrines that are often set up here and in Chile for individuals who died suddenly in accidents. It is said to be bad luck to pass a shrine to Gauchito Gil without stopping to pay respect and ask for protection on the road until the next shrine. Gauchito is the diminutive for gaucho, a traditional Argentine cowboy. 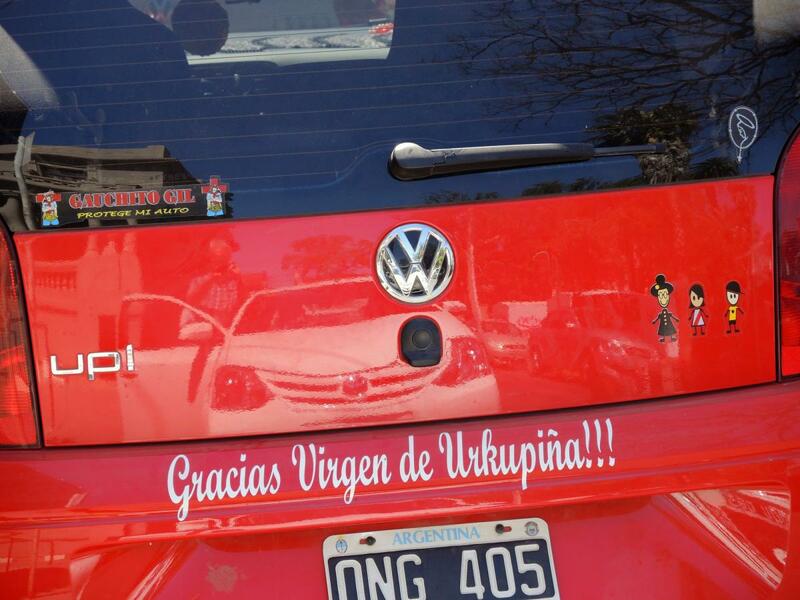 The iconography for Gauchito Gil always presents him with a red cross behind his head, and holding boleadoras, small balls on a rope that function like a lasso and that symbolize his status as a gaucho. Unlike Jesus, he stands in front of the cross in a defiant pose. Gauchito Gil is not officially recognized as a Christian saint, but many Catholics here do regard him as a reliable intercessor. Prayers and homages to him at his shrines regularly ask his protection, and he is regarded as a kind of Robin Hood figure who protects the poor and vulnerable in the face of a world that would trample them. Gauchito Gil could well be a genuine person from the 19th century, though his story is told in a variety ways, with some general outlines in common. Antonio Mamerto Gil Núñez is usually described as a cowboy bandit or outlaw, often as a conscripted civil war-era deserter who subsequently lived on the run. He is said to have been executed unjustly near the town of Mercedes in Corrientes province, near Brazil and Paraguay. The qualities of his life and his death are generally relevant to devotees, as is his ascribed ability to secure miracles. His Robin Hood image is important, and he is venerated for standing against the rich and corrupt, but he is also clearly embraced because of the tragedy he suffered. In his cult, his situation of unjust persecution and suffering is essential, even as he is said to have ultimately triumphed over those who killed him. His ability to deliver miracles is surely equally important to his cult. Frank Graziano, who has studied Gaucho Gil devotion in depth, reports that as of 2004 his primary shrine in Corrientes had 50,000 plaques giving thanks for favors from Gil.1 Gil’s feast is celebrated by devotees on January 8, when enormous crowds converge on Mercedes, Corrientes, where he is said to have been killed. Frank Graziano, Cultures of Devotion: Folk Saints in Spanish America (Oxford: 2007). 1. Frank Graziano, Cultures of Devotion: Folk Saints in Spanish America (Oxford: 2007) 128. 2. Frank Graziano, Cultures of Devotion, 120.